Our silica cat litter to which we have added a powerful bacteria-killing agent which will make this product even more long-lasting. 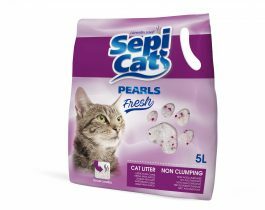 Sepicat Pearls silica cat litter is a non-clumping cat litter comprised of silica gel pearls. It contains millions of micro-pores instantly absorbing moisture effectively, assuring a clean and healthy environment. Incorporates a powerful bacteria-killing agent inhibiting the growth of bacteria causing unpleasant odor. Provides top performance (long-lasting) with little upkeep.